Dr. David Blaylock, Associate Professor of History and Affiliated Faculty of Asian Studies, presented “A Head for Business? Early Business Education in Meiji Japan” at the 64th Midwest Conference on Asian Affairs on October 16-18, 2015 in St. Louis, MO. The abstract of his paper is as follows: Prominent businessmen, social elites, and the Meiji government saw business education as a vital aspect of technology transfer. Despite this attention, young men did not graduate in large numbers from early business schools until after the Sino-Japanese and Russo-Japanese Wars. 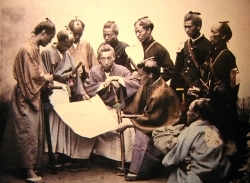 This paper will explore early efforts to establish business education, the reasons for the lack of graduates which involve doubts on the part of business people about the efficacy of formal education, questions about the need for a full business education by students, and the low opinion of business itself, which led to the exclusion of business from definitions of success in Meiji Japan. It will also look at efforts to combat the low graduation numbers through means such as the student group Ryumonsha attached to the industrialist Shibusawa Eiichi.